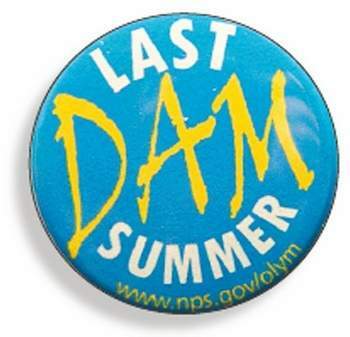 Last April, Olympic National Park began distributing 5,000 "Last Dam Summer" buttons. Park officials were heralding the 2011 tear-down of the Elwha River's two dams, an estimated $350 million history-making effort to reopen 65 miles of spawning habitat to restore the waterway's once vigorous, now tepid salmon run. "This is the last summer before big changes come to the Elwha Valley," Olympic National Park spokeswoman Barb Maynes said last week. The first big change comes in about a week, when Lake Mills closes to the public for eight weeks while a pilot channel is dug to route sediment once 210-foot Glines Canyon Dam and 108-foot Elwha Dam do come down. The dams' actual demise will not begin until Sept. 15, 2011. The project is scheduled to end by March 2014.